“Transformers” and What Will Kids Now Have to Look Forward To in Ten Years | Phil-zine! 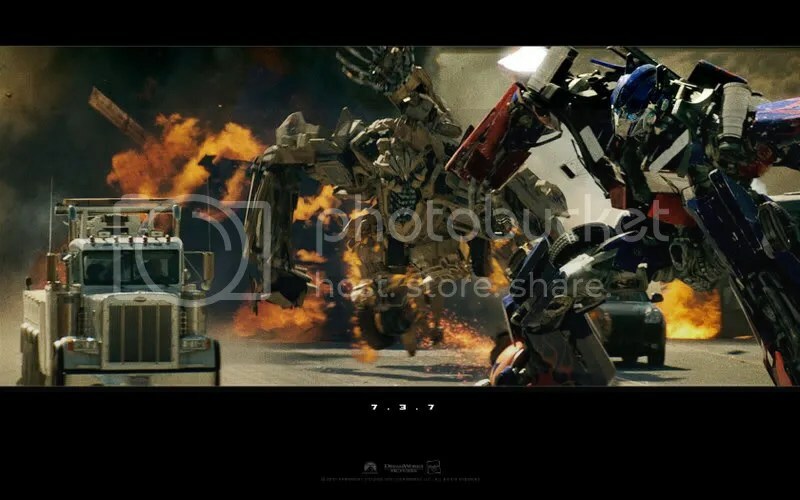 Michael Bay is a complete patriotic, to the point of being sentimental, and he wants you to know it in “Transformers”, the first in a line of Hasbro spin-offs (which will continue with “G.I. Joe” and others.) He wants you to know it really bad. He wants you to know that the human race has great potential. And that they can look really good stretched out on a car with the sun setting in the background! He argues for empathy for our troops in battle with as much gusto as Michael Moore takes down just about everything he hates (Bay even takes an easy shot at our current President ala “9/11”!) I was genuinely surprised that this was the theme of the film, that there was a theme at all, and in a lot of ways, it worked. Instead of allowing the giant robots to just fight each other while the humans looked on, the humans were able to give a helping hand. And not just one or two of the human characters in a film littered with 30 foot robots, but every character got in on the action of helping to save the day…team work folks, team work. I give serious props to Jon Voigt who takes on every character, from battling giant snakes to battling giant robots, as if he were playing Shakespeare. Kids are going to love this film, more so than they will “Rise of the Silver Surfer” and they won’t regret it later in life for doing so. While, as I’ve stated, I wasn’t blown away by this film, I am very fond of it and a lot of it may have to do with nostalgia. The thing I loved most about this movie was the relationship between a young man and his first car. I remember naming my first few cars…”The Tank” was the tan Lincoln Mercury that had jaguar skin on the dashboard and an 8-track player in front of the passenger’s seat, or “Lucy” the blue car that sped up on it’s own (somehow the name worked it’s way down from “Lucifer” because it had to have been possessed.) I thought the movie really grabbed onto that and let it become the emotional center of the film. It was the thing I remember most now as a kid, but had forgotten about, the friendship between Bumblebee and Sam (though I don’t remember his name being Sam in the cartoon.) And the more entertaining and emotionally potent scenes come from their budding friendship, though I don’t know how cool it is to make out on the hood of a sentient being…I don’t care how hot the girl is. But Bay being Bay never lingers on these moments. There’s never that awe as there were for the dinosaurs in “Jurassic Park”, and I think that’s what was lacking. Most often when they’re throwing each other around they look like a blob of metal than two characters scrapping for life and death. It’s really hard to tell any of them apart in these instances. But in the end there’s some good action, a fun comic book style of story, good sense of humor and really nothing that tarnishes this summer’s string of “tentpoles”. There was real humor in the film as well, though some misplaced jokes slipped in. I guess Michael Bay only thinks black actors are funny if they shout and show disrespect towards other family members…har, har, har. I love Anthony Anderson’s dramatic work, but I’ve never found him funny, so most of his jokes fall flat as a pancake on the floor. The scene in Sam’s bedroom, when they are looking for his great grandfather’s glasses, is one of my prized sequences of the film. For many of it’s flaws the kid in me…loved it! And I probably haven’t fully gotten across the affinity I had for Transformers as a child and how this movie captured that time capsule perfectly. Bring us a part two and fix the things that didn’t work! Then give us a moment that stands next to Optimus Prime’s death in the animated movie from 1986. That was one of the most emotionally devastating things I remember seeing as a child of 9, and watching that sequence today still still makes my knuckles white with the intensity. There’s nothing quite that provoking in this film, but there are a few moments that remember it. The thing I’m wondering most about though is that with most of the cartoons now, from ten years ago, and now even twenty years ago being adapted into movies, what will we have to look back on with any sort of nostalgia in hopes to see. With most of the current cartoons on television being ultimately forgettable what will the kids of now have to look forward to when they get a little older. Or will we in 15 years see another Transformers the Movie, reimagined by a kid who never saw the cartoon but enjoyed this movie enough. There doing it with “He-Man”. Remember that god-awful film with Dolph Lundgren? It’s probably better that you don’t. Everything in this current marketplace is thought of as ultimately two things, expendable or recyclable. A quick buck made from someone else’s idea is the easiest thing to do. “The Simpsons” are coming, “Pokemon” has been done to death, “Spongebob” had his shot already, “Alvin and the Chipmunks” will have their turn, “Rugrats” and multitudes more in the next 4 years…I know it’s tough to say but can anyone think of anything in the comic book world or cartoon world that could be to kids today what Transformers was to we, the kids of yesteryear…I can’t, because it’s all expendable or recyclable. 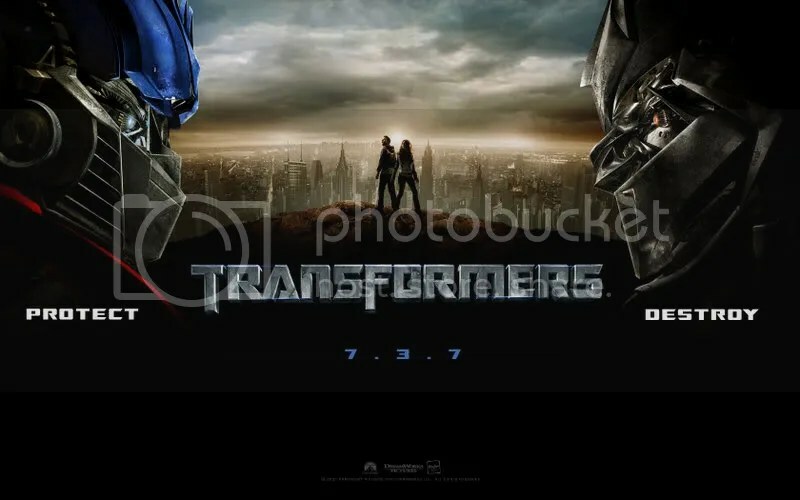 They wonder that the Transformers might be the beginning of a bad trend, with marketing and movies spooning in the comfort of a mattress filled with money. To me that’s fine, when you have a movie with cars in it, you’re going to need to make some deals with car companies – Bond does it already! If you had a movie with computers that came to life, you’d need to talk to Mac! Who cares. My big worry is that with the success of this film and potentially others is that anyone with a new and fresh idea could be seriously overlooked. It was difficult for the Producers to initially get studio funding for this film! We creative types got it hard, and I have a feeling it’s going to get even harder, and this is a serious problem for me. Let’s just hope that Pixar sticks around for a long time to come. This entry was posted on July 8, 2007 at 12:13 am and is filed under Current Movies and Reviews, Film Criticsm. You can follow any responses to this entry through the RSS 2.0 feed. You can leave a response, or trackback from your own site. Great article, i couldn’t agree with you more. All the kid shows today are just a bunch of worthless, forgettable ploys to make money for a short time. Where has all the good quality entertainment gone. It is like the writers of today are just trying to make money and don’t care what they are putting out. No memorable shows. Either that or writers today just have lost the edge of creativity, flash, and just overall good creative thinking. Daniel, in general I agree. I’ve passed by or stopped to watch several kids shows on television now and there’s very little that’s exciting in any way shape or form. The characters are generic and too cartoonish (nothing to relate to! ), the art is bizarre for the sake of being bizarre. The best cartoons I’ve seen are on cartoon network’s Adult Swim, but those are hardly for kids. Check out Frisky Dingo.